I’ve spent my entire life searching for artistic expression. I struggled to find my voice so I surrounded myself with other artists – musicians, performers, writers, and visual artists. I even married one. Becoming artistic through osmosis is a strategy that doesn’t work, in case you were wondering. Enter my mid-life crisis. That hurricane arrived at the same time the #metoo movement was hitting it’s zenith in 2017. Everything I based my inner life on was demolished. Suddenly, my old and familiar friend depression turned into unavoidable desperation as I tried to cling to old patterns that could no longer keep me afloat. The comfort of staying quiet, nice, polite, small, depressed was ripped away and I was faced with a curious and dangerous urge to shine a light into the dark corners of myself and see what might happen – like a child wondering what could happen if a magnifying glass focuses the sun on an unsuspecting ant. As the heat increased on my tiny, desperate ant-self, that damned depression really resisted. It fought back hard. But…what could happen if I truly expressed myself? So I kept shining the light. It was agonizing and brutal. And finally, when I thought I’d reached my limit, my art finally emerged. The process was particularly horrible to my small, neurotically apologetic self because, of all things, I had chosen to artistically birth an uncompromising warrior. A friend of mine said to me that as an artist, you’re a conduit; the message comes through you. I’m not a warrior. I was raised to be the consummate caretaker. But this story’s character and message came through me despite my discomfort stepping fully into these warrior boots. In the past, when met with the resistance of old patterns and depression, I’ve backed down. But with SHIELD MAIDEN, that’s not even a possibility. My show’s character Ingrid is not someone you can just trot out and then hang back up in the closet. I feel like Ingrid and the story I’ve given her are emblematic of a zeitgeist. I’m not saying anything new; I’m just saying it in a way that engages people. Plus, despite my resistance, it is so liberating to inhabit her. I wish I could go to the grocery store as her. Some days, in my mind, I do. This show comes with an added responsibility. The global political climate, the #metoo movement, social justice issues, environmental issues and raising my daughter; All these things give weight to this project for me. I resist calling myself an activist, a feminist, a warrior. Again, it’s just me struggling with who I am as I move more fully into the world. But I am all these things and I wrote a feminist play. I did it. I don’t want to do it alone though. 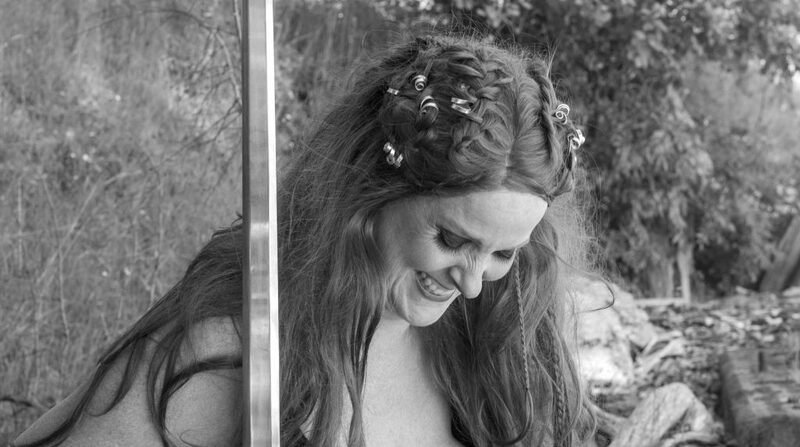 I want to shine a light on women warriors of today to empower people even further. Every time I book the show, I want to host a panel of local women leaders who sit on stage following the performance and talk about what it’s like to be a woman warrior now. 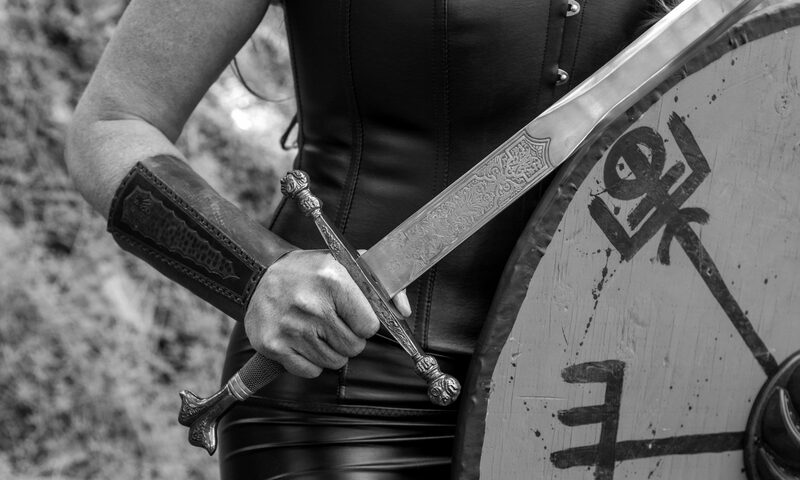 My artistic voice has landed in a Viking shield maiden. 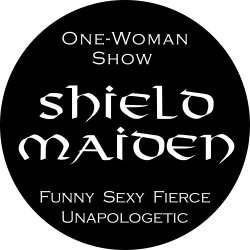 Despite, and perhaps because of my own personal challenges, I have found breathtaking joy and freedom in writing SHIELD MAIDEN. I am humbled and grateful to have made it this far and in my mind, there are no limits now.